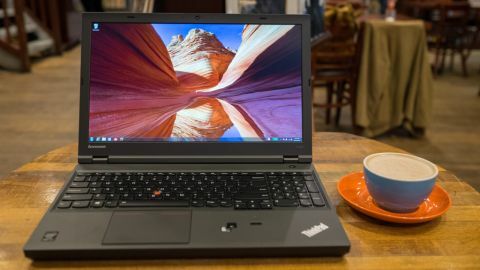 The Lenovo ThinkPad W540 is a blocky beast that weighs in at 5.57 pounds and measures 14.8 x 9.8 x 1.1 inches, much of which is due to the optical drive. By comparison, the optical drive-less MacBook Pro 15 with Retina display tips the scales at only 4.46 pounds with 14.13 x 9.73 x 0.71 inch dimensions. The 14-inch HP ZBook is by far the smallest and lightest machine, sizing up to 13.35 x 9.33 x 0.83 inches and 3.57 pounds. The configuration listed above comes to a whopping $2,573 (about £1,606, AU$2,946). It's a considerably costly machine with which to equip an entire workforce. The rig above represents the pinnacle of an all-around workstation that can do it all, and then some. Unless your business revolves around graphic design that requires heavy computing power, it might be smarter to pick a more affordable and less capable rig. The HP ZBook 14 is an even more expensive option at $3,087 (about £1,927, AU$3,535). Despite a loftier price, users will come away with a comparatively less capable machine. The HP ZBook 14 at best can be configured with a 1080p screen that pales in comparison to the W540's 3K resolution. The HP notebook is equipped with a slower 2.1GHz Intel Core i7-4600U processor and a less powerful AMD FirePro graphics chip. However, the laptop does come with 16GB of RAM, twice the amount of the W540. You might also want to consider going with Apple's latest generation MacBook Pro 15 featuring a higher-resolution 2880 x 1800 display. Available on Amazon for $1,899 (about £1,185, AU$2,174), the thin production machine is equipped with a 2.5GHz Intel Core i7 processor complemented by Nvidia's GeForce 750M GPU. It's not as powerful as the W540, but you'll get a better looking and lighter machine with double the RAM, plus better battery life, and a much more reasonable price tag. For the best bang for your buck I'll point to the Dell Precision M4800. Dell's workstation costs $2,238 (about £1,397, AU$2,563) for a nearly identical setup as the W540 listed above, plus a higher-resolution 3200 x 1800 display. The lower-cost unit also leaves more budgetary wiggle room for additional SSD storage and RAM, or other upgrades. In April we reviewed the 1080p version of the Dell M4800, so we can't definitely say it is a better machine. But at least on paper, it offers up the best bargain. With such impressive (and expensive) parts, the W540 performed flawlessly with any application I used. The W540 never stuttered, regardless of whether I was browsing the web, editing images or looking at 3D printing models in Autocad. Here's a look at how the laptop performed in our series of benchmark tests. The ThinkPad comes with a top shelf Intel Core i7-4800 processor and put up one of the highest 654- point Cinebench CPU score I've ever seen from a laptop. To put the W540's Cinebench CPU score into perspective, it closely follows the 722 points put up by the Alienware 18, the most powerful gaming laptop we've ever tested, equipped with a nearly two times faster 2.9GHz Intel Core i7-4910MQ processor. The HP Zbook 14 with its 2.1GHz Intel Core i7-4600U CPU pales in comparison, only putting up a paltry 295 points. Graphically, the W540's score also beats the competition thanks to its hardened NVIDIA Quadro K2100M graphics card. In our 3DMark graphics benchmarks the Lenovo finished the most taxing Fire Strike run with 1,710 points. In the same test, the HP ZBook 14 only put up a score of 1,208 points. A less impressive performance we'll mark up to the notebook's AMD FirePro M4100 GPU, which only features 1GB of GDDR5 video RAM. Because the late 2013 MacBook Pro 15 with Retina display we reviewed last December was running OS X Mavericks and not Windows, we can't compare benchmark scores one-to-one. However, we can use Batman: Arkham City as a measuring stick. The MacBook Pro 15 was able to run the game on 1080p and ultra settings at 39fps using just Intel's integrated ISIS graphics. The W540's performance mirrored the Apple notebook - that is before the game crashed shortly after. Games do not run well on the W540 and the problem is not due to a lack of power. Rather, it is because game developers often do not account for workstation-grade graphics cards, such as the Quadro line, when developing their titles. It's not a big knock against the ThinkPad, as all workstation machines weren't made with gaming in mind. However, you'll still be able to run Hearthstone to sneak in a quick game during your lunch break. The best thing about the W540 is its gorgeous 3K screen. At 2800 x 1620 the pixels on this 15.6-inch screen are virtually invisible. What's more, they're all tuned to produce perfect and accurate colors, which can be adjusted even more finely with the optional Integrated Color Calibrator. Post calibration, the on-screen colors became even more vibrant and true to life. The display was so good, I bumped my usual MacBook Pro 13 with Retina display to the side and edited all of my images on the W540 for this very review. Aside from images, the high-resolution makes text look crisp without turning the font into thin, unreadable lines of scribble. The pixel-rich display also makes just about any video look good. You can finally appreciate the quad-HD quality of the few snippets of 4K video on YouTube. Unfortunately, the high-resolution screen also eats into battery life. During our PCMark 8 battery test the ThinkPad W540 only lasted three hours and seven minutes. With normal use you can expect to squeeze out four hours and nine minutes split between more than a dozen tabs of web browsing, some image editing in Lightroom and streaming 4K video on YouTube. Even after activating the power saver profile on the W540 I got at best five hours and 17 minutes with modest use. Despite being a workstation machine designed for productivity and office work, there are hardly any business applications built in or bundled into the laptop's high price. Don't expect to immediately work on spreadsheets, word documents or images. Instead the IT department will have to pre-install the applications. This is where Apple has recently trumped Microsoft by including its iWork and iLife suites with every Mac and iOS device. Add in the free release of OS X Mavericks (and soon, Yosemite), and Apple has made a very tantalizing platform for employees to jump onto that lets them keep all of their systems updated for free. Most companies will have an IT department with access to its own set of licenses of enterprise software. But for smaller businesses with employees numbering in the teens, going Mac is a much better and more affordable choice. Password Vault - In case you aren't already using OnePass or LastPass, here's a built-in password manager to help you manage long and complicated authentication codes. Quick Display - To avoid embarrassing projector fumbles during your big presentation, Lenovo has included a quick connect tool for pairing the laptop to wireless displays or projectors. PC Experience - Less of an application and more of a control panel shortcut, this "program" consolidates all of the W540's Lenovo-specific settings into one panel. Airbag Protection - Customize how and when the W540's shock protection system cuts in. Messages from Lenovo - Another notification tool to prompt important Lenovo-centric updates, such as impending cloud storage limits or password vault notifications. Rescue and Recovery - Back up your data to optical media, external USB storage device, or partition a portion of the W540's internal storage. Lenovo System Update - The simplest way to download new drivers and update the ThinkPad W540. Pantone Color Calibrator - Not to be confused with the hair shampoo maker, using the X-Rite Pantone Integrated Color Calibrator is a simple matter of starting this piece of included software, picking the media type you're making, and then closing the laptop to let the sensor do its work.